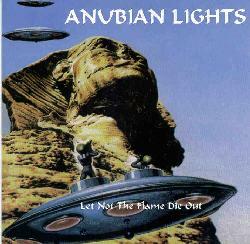 Anubian Lights - "Let Not The Flame Die Out"
Yet another project from the Pressurehed gang, Anubian Lights plays heavy electronic, often danceable, space music. The principle players are Tommy Grenas and Len Del Rio, with guests like Nik Turner, and barely noticeable contributions from Simon House on one tune, and Gilli Smyth on one track. A lot of this actually reminds me of some of the more ambient moments from Pressurehed's "Explaining The Unexplained". Pressurehed without the heavy guitars perhaps? Most of these tunes have some kind of techno beat, but the band usually has more going on musically to keep things interesting. As the band name and CD cover suggest (an alien popping out of a flying saucer and shooting at the Sphinx), the music explores Middle Eastern styles, which when combined with the synths make for a pretty far out sound. Tunes like "The Fire Breathes" and "Ali Mamoun's Broken Entranceway" use these styles to good effect, while others like "Our Man In Baghdad", and "Visions Of A New Homeland" incorporate traditional Egyptian singing and chants to make for a wild world-techno experience. While the theme is fairly consistent throughout, a few tunes break the mold to keep things interesting. "South Of Dashur" sounds like some pop tune from one of those 60's pseudo-psych flicks. Very 'groovy'. "Atoms Of The Gods" is a jazzy piece that could be part of a James Bond soundtrack. And "As Seen In 822 A.D." has a salsa rhythm combined with Middle Eastern chanting. Freaky! In summary, this will certainly appeal to those who like to follow the various projects the Pressurehed boys are involved in. SpaceRock for toe tappers.